Mesomorph Pre Workout, the complete pre-workout powder that is the only product on the market to deliver FULL CLINICAL DOSAGE AMOUNTS of its state-of-the-art ingredient! No fillers and no crash! Get the Ultimate PreWorkout Complex! Skin-Splitting Vascularity & Insane Pumps! Mesomorph pre workout is our best selling pre-workout powder. The secret is simple; it contains FULL CLINICAL DOSAGE AMOUNTS of quality, science-based ingredients! Use no fillers and designed for no pre-workout crash! Unlike other pre-workout formulas that depend on high dosages of caffeine for energy, Mesomorph does more with less. It contains less caffeine than a cup of coffee. The masterful blend of ingredients makes this possible. It provides clean long, lasting energy and concentration without the caffeine crash. For optimal muscle building, exercise form is just as crucial as repetitions and weight. 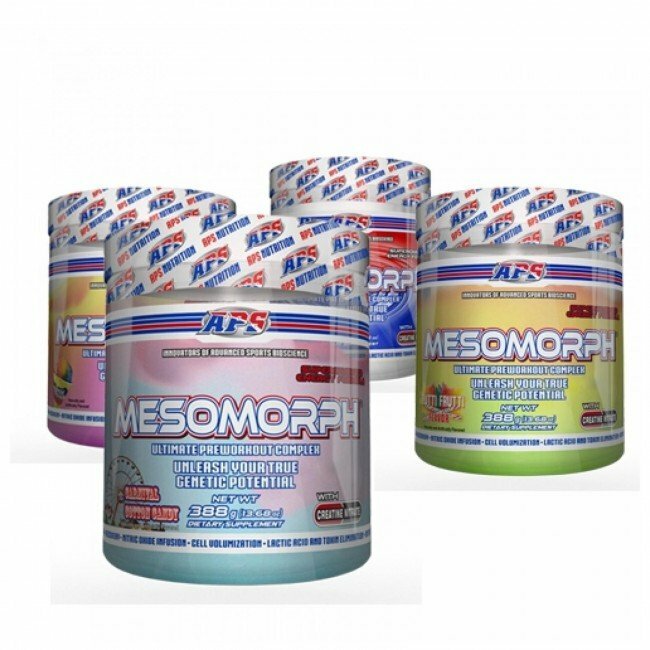 Mesomorph provides the energy and focus required for an efficient, productive workout. Why is Mesomorph Pre Workout so effective? Mesomorph does not skimp on ingredients. It is the first to deliver full doses of its primary active, pharmaceutical grade ingredients. We are talking muscle-swelling ingredients, not half doses or sprinkled ingredients seen in other pre-workouts. These include Beta-Alanine, L-Citrulline, and Creatinol-O-Phosphate for optimal performance! No fillers that cause upset stomach or bloating! Every rep feels like the first so that you can push harder and longer. Up to four times more muscle-building, energizing compared ingredients compared to other leading brands. Skin-splitting vascularity along with insane pumps! Eliminate Lactic Acid & Toxins for less pain! Boost Immune function & fight Free Radicals with complete Antioxidant Delivery! Senegalia Berlandieri also known as Guajillo is an Acacia named after Jean-Louis Berlandier, a French botanist trained in Geneva. Berlandieri arrived in Veracruz Mexico in 1826 as a biologist and plant specialist. He spent the next ten years traveling as far as Texas as he cataloged plant and animal species in the Americas. In 1956, Bennie J Camp (now Professor Camp) began studying Senegalia Berlandieri. His first study published as part of his dissertation at Texas A&M University was the first peer-reviewed article reporting the presence of N-Methylphenethylamine in Senegalia Berlandieri. APS Nutrition and netnutri bring you this state of the art preworkout powder... APS Mesomorph is your perfect preworkout supplement. APS Nutrition brings you this state of the art preworkout powder... Mesomorph Pre Workout is your complete preworkout supplement! **Precentage Dailz Values are based on a 2,000 calorie diet.